The human resource department is an 18th century invention in the wake of the industrial revolution. HR department primarily began as an employee training department. By the 20th century, federal and state governments began to regulate work conditions and businesses began to realize that employee satisfaction affected employee retention and productivity. The simultaneous changes led to the HR department that we know today. Today many HR departments must simultaneously ensure that the company abides by fair business practice legislation, sets up cultural and training initiatives to create a skilled pool of employees, and navigates the difficult social and cultural issues between employees and management. Efficient human resource departments are a neutral bridge between business leadership and the general employee population. 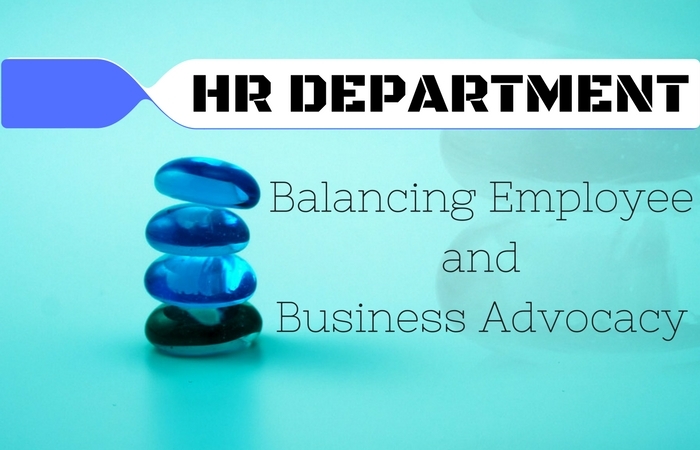 Creating an HR department that can maintain a neutral position as both an employee and business advocate can be a difficult balancing act, but it can be an important one to attempt. How Can Businesses Create a Neutral HR Department? HR departments, as much as they might wish it, don’t function in a vacuum. Even if HR employees see the need for both employee and business advocacy, business owners and managers have the power to demand a “company first” HR department. HR departments who want to become employee advocates need to begin by educating business officials about the benefits of a more neutral HR department. (And there are a myriad of benefits. Let’s face it. Businesses are in it to make money. HR departments adopting an employee advocacy job duty wouldn’t have become normalized if it hadn’t benefited the business owner). Create and maintain an ethical workplace that is in alignment with the cultural goals of the organization. Grant employees a forum to report illegal practices implemented by lower level managers to avoid legal and financial fall-out. Ensure fair and unbiased treatment of all employees to encourage a positive and diverse workforce that increases employee loyalty. Help navigate organizational change in a manner that reduces stress and avoids unexpected pitfalls. Mediate issues that arise between employees and managers before they lead to the point of no-return. Every business has an internal organizational structure. That structure often dictates what tasks they are expected to carry out and who they report to. Start-ups, due to financial constraints, often mesh the human resource department with the finance department. The danger of structure that lumps finance and human resources together is that it can create a system where the department neglects either the employee advocacy or financial frugality aspect of the job. Both stances can lead to long and short-term financial fall-out. Too much financial frugality can lead to the company being miserly to retain employees. Too much employee advocacy can lead to the company into eventual bankruptcy. It can be a far better system for both finance geared and HR geared officials within the company to work together to create policy and plans that keep both the employee and the business in mind. The HR department should be a safe place for individuals to seek help if they have experienced bullying, harassment, or discrimination. If you want to create a department that is a true employee advocate, HR employees need to be granted the agency to investigate reports of poor behavior by managers and other company officials. To avoid the creation of a hostile work environment that discourages reports of abusive employees and protects the abusers, the company should carefully vet the individual that HR reports too. The individual should be trustworthy and have a strong ethical drive. HR shouldn’t be put in the position where they are being pressured to hide the abusive behavior of managers. In the perfect world, you would be able to hire HR employees that have decades of experience running an HR department. Not all companies are that lucky. HR employees, like the employees in other departments, require just as much on the job training (both up-front and on-going) to improve. Don’t dismiss the importance of training your HR personnel. They might not contribute directly to your financial success, but they can be a key ingredient to a positive workplace culture. Emotional Intelligence: The ability to manage your own emotions and understand the emotions of others. Conflict Management and Resolution: The ability to work with others to discover the root of a problem and work towards a solution. Leadership Training: The ability to effectively communicate with employees, managers, and other individuals within the organization. Cultural Sensitivity: The ability to identify and act in a manner that exhibits an awareness and respect of cultural differences. Allowing the individuals to conduct personal research. Arranging a mentorship with another individual in the organization. Contracting an outside source to teach a workshop on the topic. Offering a scholarship to cover the cost of college classes on skills and knowledge bases necessary to human resources. The up-training of the HR department might take a little time and money, but the investment can lead to in-direct savings that will be worth it in the long run. Human resources, at its core, ensures that the company is upholding state and federal labor law, deals with the staffing and firing of employees, and handles the complaints of employees. The HR department should always focus on ensuring that employee needs are met. As employee advocates, they can work with other departments to create a culture and policies that lead to in-direct company benefits. Businesses won’t regret equipping the department with the tools and knowledge to successfully balance employee and company needs.